The four statement processing phases in SQL are parsing binding, executing and fetching. PARSE: During the parse step, Oracle first verifies whether or not the SQL statement is in the library cache. If it is, only little further processing is necessary, such as verification of access rights. If not, the statement will need to be parsed, checked for syntax errors, checked for correctness of table- and column-names, and optimized to find the best access plan, etc. The former type of parse is called a soft parse and it is considerably faster than the latter, a hard parse. BIND: It scans the statement for bind variables and assigns a value to each variable. EXECUTE: The Server applies the parse tree to the data buffers, performs necessary I/O and sorts for DML statements. FETCH: Retrieves rows for a SELECT statement during the fetch phase. Each fetch retrieves multiple rows, using an array fetch. A careful understanding of these steps will show that real user data are being processed in the steps 2 through 4; and that the step 1 merely is present for the Oracle engine to deal with the SQL statement. This first step may take considerable time and resources, and as it is overhead seen from the data processing point of view, applications should be written to minimize the amount of time spent during this step. The most efficient way to do this is to avoid the parse/optimization step as much as possible. The trace utility is very helpful to see the execution plan for a specific query WITHOUT executing it. We can obtain the execution plan and some additional statistics on running a SQL command automatically using AUTOTRACE. STATISTICS Displays statistics, but does not display execution plans. The best option is to use SET AUTOTRACE TRACE , this will not return the selected data from the query, it will return the access path from plan table and its statistics. NOTE: The most important results are the db block gets, consistent gets, physical reads, redo size, sorts (memory) and sorts (disk). • consistent gets: The number of blocks retrieved that did not change the data and therefore did not interfere with other users (i.e. by locking data). A 'consistent get' is when Oracle gets the data in a block which is consistent with a given point in time, or SCN. The consistent get is at the heart of Oracle's read consistency mechanism. When blocks are fetched in order to satisfy a query result set, they are fetched in consistent mode. If no block in the buffer cache is consistent to the correct point in time, Oracle will (attempt to) reconstruct that block using the information in the rollback segments. If it fails to do so, that's when a query errors out with the much dreaded, much feared, and much misunderstood ORA-1555 "snapshot too old". • physical reads: The number of blocks read from the disc. Basically those that cannot be satisfied by the cache and those that are direct reads. • redo size: The number of redo entries. The redo entries are written out to the online redolog files from the log buffer cache by LGWR. • bytes sent via SQL*Net to client: The number of bytes sent across the network from the server to the client. • bytes received via SQL*Net from client: The number of bytes sent across the network from the client to the server. • SQL*Net roundtrips to/from client: The number of exchanges between client and server. • sorts (memory): The number of data sorts performed in memory. • sorts (disc): The number of data sorts performed on disc. • rows processed: The number of rows processed by the query. The db block gets, consistent gets and physical reads give the number of blocks that were read to form the buffers or from the disc. For many queries, the number of physical reads is low as the data is already in the database buffers. If the number of physical reads is high then the query will be expected to be slow as there will be many disc accesses. The bytes received/sent via SQL*Net indicate how much data is being moved across the network. This is important as moving a lot of data across the network may affect the network's performance. The sorts indicate the amount of work done in sorting data during the execution of the query. Sorts are important as sorting data is a slow process. The Explain Plan command uses a table to store information about the execution plan chosen by the optimizer. Oracle provides an autotrace facility to provide execution plan and some statistics. How To Read Query Plans? The execution order in EXPLAIN PLAN output begins with the line that is the furthest indented to the right. The next step is the parent of that line. If two lines are indented equally, then the top line is normally executed first. 1 table_name - Name of plan table, default value 'PLAN_TABLE'. 2 statement_id - Statement id of the plan to be displayed, default value NULL. 3 format - Controls the level of detail displayed, default value 'TYPICAL'. Other values include 'BASIC', 'ALL', 'SERIAL'. You can also grab the Explain Plan by using the SQL ID for an already executed query. How do I see the actual number of rows and elapse time for each step in the plan? How do I get the COST of the plan to be displayed when I specify ALLSTATS LAST for the FORMAT parameter? 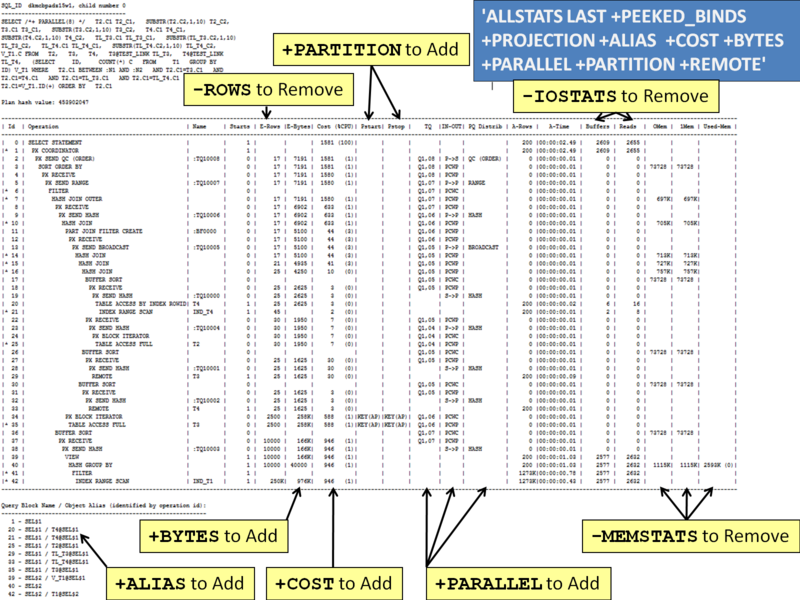 When you use ‘ALLSTATS LAST’ for the FORMAT parameter, the estimates number of bytes (BYTES) and the estimated cost for the plan (COST) are not displayed by default. You can easily have these columns displayed by adding additional predicates to the FORMATparameter. Each additional predicate is proceeded with ‘+’ sign. It’s also possible to remove columns from the plan table or other information from the output by adding additional predicates to the FORMAT parameter proceeded with a ‘-‘ sign. For example, the command below removes the E-Rows column and predicate information from below the plan. How do I determine the join order if I can’t see the plan tree with DBMS_XPLAN.DISPLAY_CURSOR? In the SQL Monitor video I showed you how I use the plan tree to determine the join order but with DBMS_XPLAN.DISPLAY_CURSOR the execution plan is displayed only as table. Although it is possible to determine the join order by looking at the indentation of the tables in the operation column, I find it far easier to use to use the FORMAT parameter of DBMS_XPLAN.DISPLAY_CURSOR to display the outline information for the plan, which will contain the join order. Adding the ‘+outline’ predicate to the FORMAT parameter will return the outline (full set of hints to reproduce the statement) for the SQL statement. In the outline information, look for the line that begins with the word LEADING. This line shows the join order for this query. In this example you see “T2”, then “B”, then “T1” referenced on this line; these are the aliases for each of the tables used in our query T2, BIG_TABLE and T1. How do I see what bind variable values were used for this execution? In SQL Monitor the bind variable values used to generate an execution plan are shown via a link in the upper right hand corner of the screen. To show the same information with DBMS_XPLAN.DISPLAY_CURSOR you simply add a ‘+peeked_binds’ predicate to the FORMAT parameter. The rightmost uppermost operation of an explain plan is the first thing that the explain plan will execute. In this case TABLE ACCESS FULL TPAIS is the first operation. This statement means we are doing a full table scan of table TPAIS When this operation completes then the resultant row source is passed up to the next level of the query for processing. In this case it is the SELECT STATEMENT, which is the top of the query. The cost field is a comparative cost that is used internally to determine the best cost for particular plans. The costs of different statements are not really directly comparable. [:Q65001] indicates that this particular part of the query is being executed in parallel. This number indicates that the operation will be processed by a parallel query slave as opposed to being executed serially. [ANALYZED] indicates that the object in question has been analyzed and there are currently statistics available for the CBO to use. There is no indication of the 'level' of analysis done. If you noticed that a session is using too much CPU, you can identify the actions performed by that session using top and Explain Plan. So first, use TOP to identify the session using high CPU and take a note of the PID. 1- FULL TABLE SCAN (FTS) - Read every row in the table, every block up to the high water mark. The HWM marks the last block in the table that has ever had data written to it. If you have deleted all the rows then you will still read up to the HWM. Truncate is the only way to reset the HWM back to the start of the table. Buffers from FTS operations are placed on the Least Recently Used (LRU) end of the buffer cache so will be quickly aged out. FTS is not recommended for large tables unless you are reading >5-10% of it (or so) or you intends to run in parallel. Oracle uses multiblock reads where it can. 2- CLUSTER - Access via an index cluster. 3- HASH - A hash key is issued to access one or more rows in a table with a matching hash value. Note the 'TABLE ACCESS BY ROWID' section. This indicates that the table data is not being accessed via a FTS operation but rather by a rowid lookup. In this case looking up values in the index first has produced the rowid. The index is being accessed by an 'INDEX UNIQUE SCAN' operation. This is explained below. The index name in this case is EMP_I1. If all the required data resides in the index then a table lookup may be unnecessary and all you will see is an index access with no table access. Indexes are presorted so sorting may be unnecessary if the sort order required is the same as the index. In the next example the index is sorted so the rows will be returned in the order of the index hence a sort is unnecessary. In the next example we will forcing a full table scan. Because we have forced a FTS the data is unsorted and we must sort the data after it has been retrieved. This is a method for accessing multiple column values. You must supply AT LEAST the leading column of the index to access data via the index. Can be used for range operations (e.g. >, <, <> , >=, <= , between). e.g. In certain circumstances it is possible for the whole index to be scanned as opposed to a range scan (i.e. where no constraining predicates are provided for a table). Oracle chooses an index Full Scan when you have statistics that indicate that it is going to be more efficient than a Full table scan and a sort. For example Oracle may do a Full index scan when we do an unbounded scan of an index and want the data to be ordered in the index order. The optimizer may decide that selecting all the information from the index and not sorting is more efficient than doing a FTS or a Fast Full Index Scan and then sorting. An Index full scan will perform single block i/o's and so it may prove to be inefficient. Processes all leaf blocks of an index, but only enough branch blocks to find 1st leaf block. Used when all necessary columns are in index & order by clause matches index struct or if sort merge join is done. Scans all the block in the index. Rows are not returned in sorted order. Note that INDEX FAST FULL SCAN is the mechanism behind fast index create and recreate. Scans all blocks in index used to replace a FTS when all necessary columns are in the index. Using multi-block IO & can going parallel. Index BE_IX is a concatenated index on big_emp (empno, ename). There are three kinds of join conditions: nested loops, merge joins, and hash joins. Each has specific performance implications, and each should be used in different circumstances. b. Hash joins read the smaller tables into a hash table in memory so the referenced records can be quickly accessed by the hash key. Hash joins are great in data warehouse scenarios where several smaller tables (with referential integrity defined) are being referenced in the same SQL query as a single larger or very large table. The hash join has ab initial overhead (of creating the hash tables) but performs rather well no matter how many rows are involved. c. Sort Merge or Merge joins work by selecting the result set from each table, and then merging these two (or more) results together. Merge joins are useful when joining two relatively large tables of about the same size together, the merge join starts out with more overhead but remains rather consistent. It's important that efficient index access is used on the inner table (Table2 in this example) or that the inner table be a very small table. This is critical to prevent table scans from being performed on the inner table for each row of the outer table that was retrieved. OUTER - A nested loops operation to perform an outer join statement. Note: You will see more use of nested loop when using FIRST_ROWS optimizer mode as it works on model of showing instantaneous results to user as they are fetched. There is no need for selecting caching any data before it is returned to user. In case of hash join it is needed and is explained below. b. HASH JOIN - An operation that joins two sets of rows and returns the same result. -ANTI - A hash anti-join. -SEMI - A hash semi-join. Hash joins are used when we are joining large tables. The optimizer uses the smaller of the 2 tables to build a hash table in memory and the scans the large tables and compares the hash value (of rows from large table) with this hash table to find the joined rows. Build a in-memory hash table on smaller of the two tables. Unlike nested loop, the output of hash join result is not instantaneous as hash joining is blocked on building up hash table. The Hash Join is is a very efficient join when used in the right situation. With the hash join, one Table is chosen as the Outer table. This is the larger of the two tables in the Join - and the other is chosen as the Inner Table. Both tables are broken into sections and the inner Tables join columns are stored in memory (if hash_area_size is large enough) and 'hashed'. This hashing provides an algorithmic pointer that makes data access very efficient. Oracle attempts to keep the inner table in memory since it will be 'scanned' many times. The Outer rows that match the query predicates are then selected and for each Outer table row chosen, hashing is performed on the key and the hash value is used to quickly find the matching row in the Inner Table. This join can often outperform a Sort Merge join, particularly when 1 table is much larger than another. No sorting is performed and index access can be avoided since the hash algorithm is used to locate the block where the inner row is stored. Hash-joins are also only used for equi-joins. Other important init.ora parms are: hash_join_enabled, sort_area_size and hash_multiblock_io_count. Note: You may see more hash joins used with ALL_ROWS optimizer mode, because it works on model of showing results after all the rows of at least one of the tables are hashed in hash table. 2) Access the inner table, choose the rows that match the predicates in the Where clause of the SQL statement. 3) Sort the rows retrieved from the inner table by the joining columns and store these as a Temporary table. This step may not be performed if data is ordered by the keys and efficient index access can be performed. 4) The outer table may also need to be sorted by the joining columns so that both tables to be joined are sorted in the same manner. This step is also optional and dependent on whether the outer table is already well ordered by the keys and whether efficient index access can be used. 5) Read both outer and inner tables (these may be the sorted temporary tables created in previous steps), choosing rows that match the join criteria. This operation is very quick since both tables are sorted in the same manner and Database Prefetch can be used. 6) Optionally sort the data one more time if a Sort was performed (e.g. an 'Order By' clause) using columns that are not the same as were used to perform the join. The Merge Join can be deceivingly fast due to database multi-block fetch (helped by initialization parameter db_file_multiblock_read_count) capabilities and the fact that each table is accessed only one time each. These are only used for equi-joins. The other init.ora parm that can be tuned to help performance is sort_area_size. OUTER - A merge join operation to perform an outer join statement. -ANTI - A merge anti-join. -SEMI - A merge semi-join. Important point to understand is, unlike nested loop where driven (inner) table is read as many number of times as the input from outer table, in sort merge join each of the tables involved are accessed at most once. So they prove to be better than nested loop when the data set is large. When optimizer uses Sort merge join? a) When the join condition is an inequality condition (like <, <=, >=). This is because hash join cannot be used for inequality conditions and if the data set is large, nested loop is definitely not an option. b) If sorting is anyways required due to some other attribute (other than join) like “order by”, optimizer prefers sort merge join over hash join as it is cheaper. Sorts are expensive operations especially on large tables where the rows do not fit in memory and spill to disk. By default sort blocks are placed into the buffer cache. This may result in aging out of other blocks that may be reread by other processes. This example is also interesting in that it has a NOSORT function. The group by does not need to sort because the index row source is already pre sorted. When a view cannot be merged into the main query you will often see a projection view operation. This indicates that the 'view' will be selected from directly as opposed to being broken down into joins on the base tables. A number of constructs make a view non mergeable. Inline views are also non mergeable. Optimizer Method and how to know the Driving Table. A small "golden rule" is that your driving table should be the table that returns the smallest number of rows (so you need to look at the where clause), and this is not always the table with the smallest number of rows. But…. Where to specify the driving Table? Oracle processes result sets a table at a time. It starts by retrieving all the data for the first (driving) table. Once this data is retrieved it is used to limit the number of rows processed for subsequent (driven) tables. In the case of multiple table joins, the driving table limits the rows processed for the first driven table. Once processed, this combined set of data is the driving set for the second driven table etc. Roughly translated into English, this means that it is best to process tables that will retrieve a small number of rows first. The optimizer will do this to the best of its ability regardless of the structure of the DML, but some factors may help. Both the Rule and Cost based optimizers select a driving table for each query. In the RBO (Rule Based Optimizer) the driving table is the LAST TABLE in the FROM CLAUSE (chooses the driving order by taking the tables in the FROM clause RIGHT to LEFT). If a decision cannot be made, the order of processing is FROM the END of the FROM clause to the START. In RBO, we have a habit of ordering tables right-to-left in queries, right being the driving table for the query. In CBO, I had to adapt to ordering from left-to-right, left being the driving table. The ORDERED hint used in CBO picks up tables left-to-right for processing. Take a pick. Hence, it is important to have good statistics to pick up the correct driving table. The WHERE clause is the main decision maker about which indexes to use. You should always try to use your unique indexes first, and then if that is not possible then use a non-unique index. For a query to use an index, one or more fields from that index need to be mentioned in the WHERE clause. On concatenated indexes the index will only be used if the first field in the index is mentioned.On 10g that in not needed any more!!! The more of its fields are mentioned in the where clause, the better an index is used. Although two SQL statements may produce the same result, Oracle may process one faster than the other. You can use the results of the EXPLAIN PLAN statement to compare the execution plans and costs of the two statements and determine which is more efficient. Following are some tips that help in writing efficient queries. Prior to Oracle Database 10g, the only way to flush the database buffer cache was to shut down the database and restart it. Oracle Database 10g now allows you to flush the database buffer cache with the alter system command using the flush buffer_cache parameter. The FLUSH Buffer Cache clause is useful if you need to measure the performance of rewritten queries or a suite of queries from identical starting points. Use the following statement to flush the buffer cache. However, note that these clauses are intended for use only on a test database. It is not advisable to use them on a production database, because subsequent queries will have no hits, only misses. NUMBER If you don’t specify a precision, as in NUMBER(12,2), Oracle supports up to 38 digits of precision. If you don’t need this precision, you’re wasting memory. CHAR This is a fixed-length character string and is mostly available for compatibility purposes with code written in earlier versions of Oracle. The values assigned to CHAR variables are right-padded with spaces, which can result in unexpected behavior. Avoid CHAR unless it’s specifically needed. VARCHAR2 The greatest challenge you will run into with VARCHAR2 is to avoid the tendency to hard-code a maximum length, as in VARCHAR2(30). Use %TYPE as described later in this sectoin. INTEGER If your integer values fall within the range of –231+1 .. 231–1 (a.k.a. – 2147483647 .. 2147483647), you should declare your variables as PLS_INTEGER. This is the most efficient format for integer manipulation (until you get to Oracle Database 10g Release 2, at which point BINARY_INTEGER, PLS_INTEGER and all the other subtypes of BINARY_INTEGER offer the same performance). Anchor variables to database datatypes using %TYPE and %ROWTYPE. When you declare a variable using %TYPE or %ROWTYPE, you “anchor” the type of that data to another, previously defined element. If your program variable has the same datatype as (and, as is usually the case, is acting as a container for) a column in a table or view, use %TYPE to define it from that column. If your record has the same structure as a row in a table or view, use %ROWTYPE to define it from that table. Your code will automatically adapts to underlying changes in data structures. Try to perform the following, is much faster !!!! In these examples only single a record is retrieved in the presence/absence check. 2. Avoid the use of NULL or IS NOT NULL. 3. Select the data that you need ONLY!!! When selecting from a table, be sure to only select the data that you need. If an alias is not present, the engine must resolve which tables own the specified columns. A short alias is parsed more quickly than a long table name or alias. If possible, reduce the alias to a single letter. This is efficient where a relatively small number of rows are processed by the query, but considerable overhead is incurred when a large number of rows are read. The Sales table will be processed first and then all entries with a total_sales_amt > 10000 will be joined to the Customer table. This is efficient where a large number of rows is being processed. The optimizer is more likely to translate an IN into a join. It is important to understand the number of rows to be returned by a query and then decide which approach to use. use IN over EXISTS (i.e. non-correlated subquery vs. correlated subquery). In is similar to a merge-scan while Exists is similar to a nested-loop join. There are some cases where EXISTS can outperform IN, but in more cases IN will dramatically out-perform EXISTS. In general, IN is better than EXISTS. EXISTS tries to satisfy the subquery as quickly as possible and returns ‘true’ if the subquery returns 1 or more rows – it should be indexed. Optimize the execution of the subquery. Subqueries may be written using NOT IN and NOT EXISTS clauses. The NOT EXISTS clause is sometimes more efficient since the database only needs to verify non-existence. With NOT IN the entire result set must be materialized. Another consideration when using NOT IN, is if the subquery returns NULLS, the results may not be returned (at all). With NOT EXISTS, a value in the outer query that has a NULL value in the inner will be returned. Not In performs very well as an anti-join using the cost-based optimizer and often performs Not Exists when this access path is used. Outer joins can also be a very fast way to accomplish this. Use IN instead of EXISTS. A simple trick to increase the speed of an EXISTS sub query is to replace it with IN. The IN method is faster than EXISTS because it doesn’t check unnecessary rows in the comparison. But this tip will be useful only if the inner query returns a small number of rows. If the inner query retrieves a larger row set, then it is better to use EXISTS. 36% Time Reduction could be achieved. 6. Use Joins in place of EXISTS. 7. Use EXISTS in place of DISTINCT. The following SQL statement is a better alternative. 48% Time Reduction could be achieved. The optimizer fully evaluates expressions whenever possible and translates certain syntactic constructs into equivalent constructs. This is done either because Oracle can more quickly evaluate the resulting expression than the original expression or because the original expression is merely a syntactic equivalent of the resulting expression. If a SQL statement contains the first condition, the optimizer simplifies it into the second condition. Note that the optimizer does not simplify expressions across comparison operators. The optimizer does not simplify the third expression into the second. For this reason, application developers should write conditions that compare columns with constants whenever possible, rather than conditions with expressions involving columns. The Optimizer does not use index for the following statement. Instead use the following statement. 9. Never use NOT in an indexed column. Whenever Oracle encounters a NOT in an index column, it will perform full-table scan. Note: Optimizer uses the index only when optimizer_goal is set to FIRST_ROWS. Note: Index can tell you what is there in a table but not what is not in a table. Note: Optimizer uses the index only when optimizer_goal = FIRST_ROWS. Note: || is the concatenate function. Like other functions it disables index. Note: Optimizer uses the index only when optimizer_goal=FIRST_ROWS. In Dynamic SQL, this is a MUST!!! That is pretty dramatic. The fact is that not only does this execute much faster (we spent more time PARSING our queries then actually EXECUTING them!) it will let more users use your system simultaneously. 12. Use the same convention for all your queries. Even differing spaces in the statement will cause this lookup to fail. Assuming the statement does not have a cached execution plan it must be parsed before execution. - When using AND Clauses in the WHERE Clause, put the most stringent AND Clause furthest from the WHERE. - When using OR Clauses in the WHERE Clause, put the most stringent OR Clause closest to the WHERE. The HAVING clause filters selected rows only after all rows have been fetched. Using a WHERE clause helps reduce overheads in sorting, summing, etc. HAVING clauses should only be used when columns with summary operations applied to them are restricted by the clause. Do not use a commit or DDL statements inside a loop or cursor, because that will make the undo segments needed by the cursor unavailable. Many applications commit more frequently than necessary, and their performance suffers as a result. In isolation a commit is not a very expensive operation, but lots of unnecessary commits can nevertheless cause severe performance problems. While a few extra commits may not be noticed, the cumulative effect of thousands of extra commits is very noticeable. Look at this test. Insert 1,000 rows into a test table -- first as a single transaction, and then committing after every row. Your mileage may vary, but these are my results, on an otherwise idle system show a performance blowout of more than 100% when committing after every row. Note how the first query returns only one record and the second returns two. A UNION forces a big sort and deduplication—a removal of duplicate values. Most of the time, this is wholly unnecessary. To see how this might affect you, I'll use the data dictionary tables to run a WHERE EXISTS query using UNION and UNION ALL and compare the results with TKPROF. The results are dramatic. Quite a change! What happened here was that the WHERE EXISTS stopped running the subquery when it got the first row back, and because the database did not have to bother with that deduplicate step, getting the first row back was very fast indeed. The bottom line: If you can use UNION ALL, by all means use it over UNION to avoid a costly deduplication step—a step that is probably not even necessary most of the time. This is a CRITICAL point. So make use of Explain Plan!!! 20. Recommendation to work with dates. Normally, an outer join of table A to table B would return every record in table A, and if it had a mate in table B, that would be returned as well. Every row in table A would be output, but some rows of table B might not appear in the result set. A full outer join would return ebery row in table A, as well as every row in table B. The syntax for a full outer join is new in Oracle 9i, but it is a syntactic convenience, it is possible to produce full outer joins sets using conventional SQL. 23. Use BETWEEN instead of IN. The BETWEEN keyword is very useful for filtering out values in a specific range. It is much faster than typing each value in the range into an IN. 59% Time Reduction could be achieved.